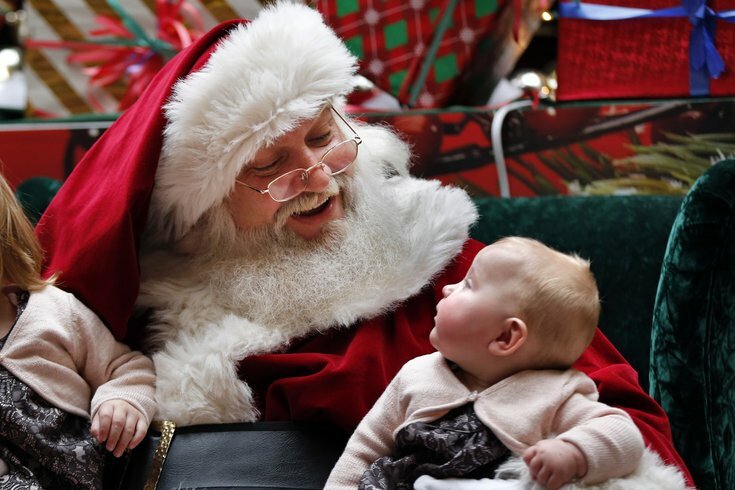 A man portraying Santa Claus talks to 6-month-old Aubree-Jane Halladay, of Scarborough, Maine on Thursday, Dec. 19, 2013. After some parents expressed displeasure with a $35 fee to see Santa at the Cherry Hill Mall this year, the shopping center decided to nix the cost of admission altogether. "We appreciate our loyal customers and will continue to incorporate social and compelling experiences into the mall environment throughout the year for all to enjoy," Cherry Hill Mall Management said in a statement. "We hope families from around the region check out this must-visit holiday destination at the Cherry Hill Mall and also visit our other traditional Santa experiences at our six sister properties in the Philadelphia region." The display, created by Dreamworks, features characters from "Shrek" and the jolly man in red. Visitors take a virtual roller coaster ride to the North Pole for their visit with Santa. They can choose from three packages ranging in price from $35 to $75 for up to five people. Photos in various sizes are available, as well as videos and a personalized "boarding pass." The attraction debuted last year, but this year, it originally cost $35, upsetting some parents. Many parents, who felt the price is too high for low-income families, took their complaints to the mall's Facebook page. "Charging to see Santa?? Come on now. Kids just want to see Santa," Facebook user Joseph Pekora wrote. "This does not require a large production show. Shame on you." "Any child should have the ability to see Santa at the mall without having to pay money to go through an attraction first," Karen Wilson added. Some were upset that Santa is hidden inside the display and out of view of regular shoppers. "It's awful enough that the Cherry Hill Mall is charging $35 for kids to sit on Santa's lap, but the fact that they have Santa locked up and completely out of view from shoppers is even more Scrooge-like," wrote Facebook user Daniel Kochanowicz. "One of the perks of Christmas shopping in a mall is catching a glimpse of Santa on his throne, holding a kid or two in his lap and trying to stay jolly no matter what time of day or how loud or wet the kiddies." But not all of the comments were negative. "Most people don't realize the amount of work, time and money that goes into setting things like this up," Facebook user Will Price wrote. "In addition the malls aren't generating the revenue they used to due to online shopping. The profits that [were] once used to supplement the Santa visits are dwindling, so it has to be put on the people that visit the attraction to pay for it." In several responses to posts on its Facebook page, Cherry Hill Mall suggested an alternative event before making the display free. "In addition to the Dream Place attraction, Cherry Hill Mall is also hosting Snack Time with Santa this season," a spokesman wrote in response to a Facebook post. "This free event features Santa Claus, breakfast snacks, crafts, face painter and more."